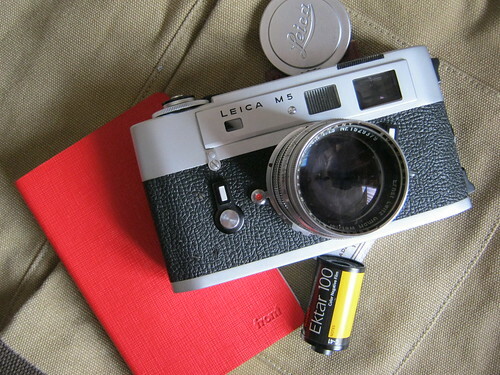 The Leica M5 is part of the Leica M-series rangefinder 35mm film camera system released in 1971. It was their first rangefinder camera to feature a TTL exposure meter. It was a polarizing model: praised for its TTL metering and good ergonomics; condemned for its girth and abandonment of the classic Leica M3 body styling. Its market failure left Leica in confusion, even considering ceasing rangefinder production altogether. Finally, production of the M4 as M4-2 was resumed in Canada continuing the system. The M5 body was a new design, larger than the earlier M series cameras. It is wider, taller and heavier than other M cameras and has twin strap lugs on one side of the body for vertical hanging. Later models have a third strap lug for horizontal hanging. The M5 was available in traditional silver chrome as well as a version called black chrome. 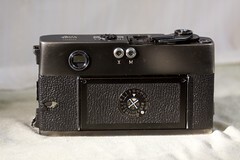 The M5 was the first M camera to use the black chrome process, other black models in the past were usually painted. The shutter is horizontal traveling and made of cloth from the earlier M4. 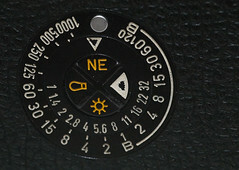 The shutter dial has click stops speeds from 1/2 to 1/1000sec and B. 1 to 30sec are also on the shutter dial but are only for the meter as they must be timed manually. The M5 has a self-timer which is uncommon on later M cameras. It is entirely mechanical and winds the counter clockwise on the front of the camera. 1 sec exposures can be made by setting the shutter knob on B1 and using the self-timer. A hot shoe is available along with a 1/50 of a sec flash sync. There are PC terminals for flash sync located on the back of the top plate for X electronic and M bulb. One of the best design features of the M5 is the large shutter speed dial which overhangs the front sightly. It is very easy to adjust without taking the camera away from your eye. The best way is to use the middle finger to rotate the shutter knob, while the trigger finger is on the shutter release. Your thumb can operate the film advance lever which can be used in a single or multiple short strokes. It sits on top of the shutter dial. A threaded shutter release button sits on top of the advance lever, making it very natural to rotate the shutter, fire the release and advance the lever with the right hand. This frees up the left hand for lens manipulations like aperture selection and focusing. The standard viewfinder has a 0.72 magnification with auto parallax correction. It has a RF base length of 68.5mm, with magnification is equal to 49.32 mm. The bright frame lines are automatically set based on the lenses used. It supports frame line with 35, 50, 90 and 135mm lenses. 35/135, share the same frame. There is also manual frame selector lever on the face of the camera. This can be handy to preview frame lines with other lenses. The lever can also function as a battery check. Press the lever away from the lens to activate the check. The meter bar in the finder indicates the power level. It has shutter speeds setting displayed in the finder, reducing the need to check to shutter dial. The M5 meter uses a CdS cell which is located on a swinging arm and positioned directly behind the lens when the camera is cocked. Pressure on the shutter release causes the meter sensor to retract. Film speeds are set on the top plate of the camera with a range of 6 to 3200 ASA (9 to 36 DIN), sensitivity of 0 to 20 EV, and powered by a 1.35 V PX165 mercury battery. 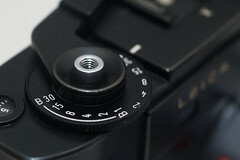 Though it uses a match needle system, the M5 meter operation is different from most other cameras. Meter reading can most accurately be made with the camera in the horizontal position. The meter is active only when the camera is cocked and ready. The meter becomes inactive after exposure. The finder displays the shutter speed in the lower part of the finder. To the right of that is a long horizontal bar which is illumination by a window located on the edge between the front and top plate of the camera above the viewfinder. There are two needles that cross this bar. Adjust the shutter speed dial and or f/stop ring until the three intersect. 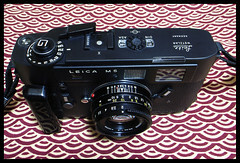 Film loading is similar to other Leicas and is done by removing the bottom plate and flipping up the back plate. Inserting the film cartridge half way and withdrawing the film leader from the cartridge. Inserting the leader into the take up spool. This spool is a newer design and film leaders are much easier to insert. Proper loading can be checked by advancing the film and viewing the rotation of the rewind crank on the base of the camera. The back door still has a film reminder dial and scale. Some deep wide angle and collapsible lenses can foul the metering arm and should not be used. This page was last edited on 14 March 2018, at 06:17.